Summary: Building a Lawn is different for everyone. Some people go to great lengths to create the “best” possible conditions for a lawn to look great and thrive. One reader (Rosalie) shares their “journey”. There is no secret formula for a good lawn, wherever it may be planted. Results are always obtained if it is planted on a good seed bed (good lawn soil), and if it has food and drink – in moderation, of course. Just as we humans are healthy on a regular well balanced diet, all things planted in a garden are content and healthy if the same pattern is followed. 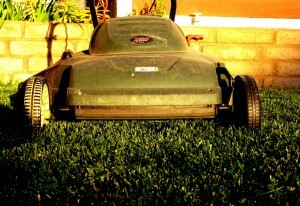 Lawns in the Southwest do require some special attention which results in success. After a road trip last summer, through the South and the Midwest. We arrived home, and was surprised to find that right here in Albuquerque were some of the most beautiful lawns I had seen. Fine lawns are even more numerous in Denver, Colorado and Los Alamos, New Mexico, and those I saw in Amarillo, Texas would satisfy anyone. My own lawn, built three years ago for our new home, although not perfect, is among the best. I tried all my pet theories in it so it can almost be classed as an experimental plot. Fortunately, no fill was needed as I kept the soil level 3 inches lower than the walk, driveway and curb levels to allow for buildup from “blow sand.” This is one of the lawn owners greatest nuisances in much of this area. In four years, I have seen a lawn level rise as much as 4 inches. Some lawn makers feel they must haul in new soil regardless. It is much more advisable to spend the money for more organic lawn material. If fill is needed, never use the dead earth from basement excavations. All of our Southwest soil, with the exception of mountain areas, lacks humus. With pine sawdust available, I put 2 inches over the area (pine sawdust is not as good as that from oak or other woods). This I exposed to our Southwest sunshine for two months to leach away the resins. After all debris from building was removed, I covered the area with one inch of cow manure and had the area rotary tilled. It was carefully raked to remove heavy clods and stones. Next came 4 pounds per hundred square feet of my “witch’s brew” which was mixed in one big pile before spreading. This in equal parts, was sewerage sludge (Milorganite), soil or agriculture sulphur, super-phosphate, iron sulphate, cottonseed meal and sulphate of ammonia (to give the nitrogen which the sawdust would take from the soil until on its way to decomposition). After this was spread over the soil, it was again raked and irrigated thoroughly. It stood a week or two while the irrigation system was installed. If I had not been in a hurry to plant, I would have planted a cover crop or at least have waited a longer period for my “witch’s brew” to start to work, and for weed seed to germinate. Again a thorough raking, followed by rolling. At this point, it all had to be very level. Peat moss was put over the top – about a half inch in depth—and raked into the soil. It was lightly sprinkled and allowed to stand overnight. Early next morning, when there was no trace of wind, the blue grass and clover seed were spread. I walked in one direction and then crosswise to get complete coverage. Raking this time was light. The clover germinates quickly and is good for the soil although many dislike its appearance. I think it gives texture and interest to a lawn just as a deep, shaggy pile or cut design gives interest to a rug. The clover is good for the soil. The seeded soil was not allowed to dry out until after germination was complete and it could gradually be weaned from so much water. After the lawn was established, because of water rationing. I wanted to see just how long it could go without water and still remain healthy. I found it could go four days if irrigation was thorough and deep. I always had difficulty in trying to persuade others to go this long. Lack of water is frightening and every gardener should make an effort to conserve it. I always irrigate after severe wind storms. In maintaining the lawn, remove all weeds as they appear. Early morning irrigation – and never after 4:00 P.M. is the rule. This helps to prevent diseases. Dangerous chemicals and weed killers are not used. The time May comes when this may be necessary, but I shall use the utmost caution in selection and application. Lawns should be raked several times during severe periods of higher temperatures to aerate them. They should not be cut shorter than 2 inches. Fertilizer should never be applied in extreme heat. Early morning or evening is the ideal time. Of course, thorough watering after application is imperative. We have our share of pests and diseases. There are army worms and sod web worms. Reliable products should always be used to fight these. Timing is important and several applications may be necessary. Proper morning irrigation helps in the protection from grass fungus diseases. Crabgrass and dandelions are everybody’s trouble. Daily digging is best. The perfect grass does not exist although progress with new mixtures is being made. Bluegrass and clover are still best (in my opinion) with Bermuda to serve the extreme southeastern areas of our Southwest. Good lawns are given at least three feedings during the season, one in early spring just as growth starts, another in early summer and a final one in early fall. Where rye grass is planted for winter green over established lawns, cut it closely in the spring to allow sunlight – this keeps the permanent grass from dying out. With the coming of hot weather, leave the grass longer. Regular, thorough waterings are necessary during the dry season reports. Buying high-grade seed is important as many weeds come from a cheap grade. February – farmyard manure or compost. March – to each 100 pounds of sewerage sludge (Milorganite) is added 10 pounds each—soil sulphur, iron sulphate, superphosphate, cottonseed meal, and sulphate of ammonia. Use 4 pounds per 100 square feet. April – 5-10-5 – with one-tenth iron sulphate. Four pounds per hundred square feet. May, June, July and August – Miracle Gro Liquid as directed. September – same as April, October – same as March. Sometime I hope to have my soil so built up all this will not be necessary. Then I may have enough compost. A fine English gardener once told me it really takes two hundred years to build a good lawn! In this region the process will be slow because constant irrigation washes many of the minerals to the subsoil. Use your lawn, enjoy it, feed and water it, and do not cut too short. Above all, do not worry about each bug or weed.